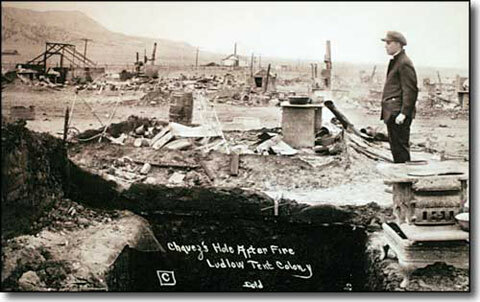 April 20th, 2014, is the 100th anniversary of the Ludlow massacre, which historian Wallace Stegenr described as “One of the bleakest and blackest episodes of American labor history.” The massacre claimed the lives of between 19 and 26 people, two of whom were women and 11 of whom were children who were burned/asphyxiated when the Colorado National Guard set fire to a tent that was over the man made cave where they had sought shelter. The riots that ensued would end up claiming the lives of approximate 66 people. All in all, over the course of the strike which lasted from September 1913 to December 1914, it is believed that as many as 200 people died. In 1915, after a public outcry, the House Committee on Mines and Mining investigated the massacre. Their report contributed to the creation of the eight hour workday and stronger child labor laws. In a time when rich corporate owners can practically buy their own congressmen and when corporations are successfully hacking away at workers rights, the events of April 20th, 1914 are still very relevant today. Many years after the massacre Woody Guthrie memorialized the event in a song that is today’s “Hymn of Social Justice.” I hope that those who died in that struggle did not die in vain.